I hesitated to even write this post. Making a cup of tea is a sacred British ritual, and discussing how to brew ‘a proper cup of tea’ is bound to cause controversy. Even moreso here, because as you may have noticed, I’m American. I’ve always enjoyed drinking tea, but never thought much about the process of making it. Mug, tea bag, hot water, done. But since moving to England, I’ve learned it’s a complex subject where every person has a different opinion on what constitutes a proper cuppa. This was first brought to my attention at work, where you are socially obligated (peer pressured?) to offer everyone a cup of tea when you make one for yourself. Now the confusion begins. Leave the tea bag in the mug or take it out? Acceptable brewing time? 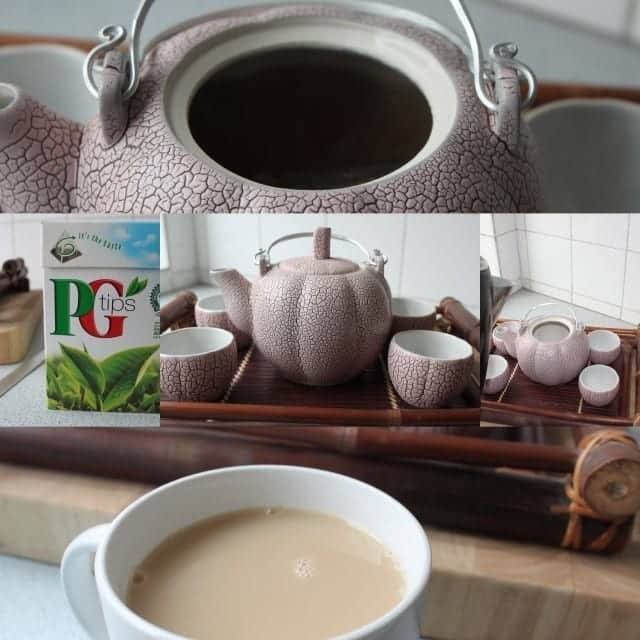 Brew a pot of tea or individual mugs? And the biggest question … add the milk to the cup first? Or add the tea first, and the milk after? I kid you not, these were actual criticisms and discussions around the office kitchen. In an attempt to learn how to make a proper cup of tea, I turned to my vintage library. According to Mrs. Beeton (1861) “There is very little art in making good tea; if the water is boiling, and there is no sparing of the fragrant leaf, the beverage will almost invariably be good.” See, that’s what I thought too … but apparently most British people today differ. You should always brew tea in a teapot, and pour it into a cup after brewing. Put your kettle on to boil. Put some warm water in the teapot for 3-4 minutes to warm up the teapot prior to brewing. Empty the teapot of the water, and add the tea. Normally the amount is 1 teabag per cup, or 1 tsp. of loose tea per cup. If using loose tea, you may want to place it in a tea strainer so it can be easily removed after brewing. Now fill the teapot with water that has just come off the boil. Let the tea brew for 5 minutes. Serve the tea immediately. Or, if you’ll have tea leftover, remove the tea bags / tea strainer, or transfer the brewed tea into another, warmed container to avoid overbrewing. Brewing the tea for too long extracts too many tannins and makes the tea bitter. How do you brew a proper cup of tea?? never pour boiling water over tea.The Chinese say that this destroys the flavor. The water should have bolied, but wait a few seconds until the boiling stops. I love your pictures by the way, and your lovely tea set! I think lose tea is always going to make bestest brews, which goes for herbal teas too, but they’re more work. I heard that the issue of milk first comes from the times where china was too delicate and would crack / break if you poured the very hot tea in it first… I also heard that if you don’t add milk to the brew (when the tea’s still brewing) for it hampers the brewing. Asking how everyone likes their tea really can be cumbersome… The other day, we had a plumber in and I offered to make him a cup, but beyond asking for sugar and milk preference, I took executive decisions 🙂 I don’t believe anybody would actually taste the difference! Ooh tricky!! I don’t even drink normal tea but being a Brit I do know how to make one!